Chlorella is a super food and is a fibrous material which may help support and maintain healthy digestion and overall digestive track health. Useful for people whose diet may be deficient in green vegetables or fruit. Chlorella is a natural microscopic plant containing over 20 vitamins and minerals, 65% protein and is abundant in essential micronutrients and RNA/ DNA nucleic acids. It is nature’s richest source of Chlorophyll. As such, it has powerful cleansing and detoxifying properties. The detoxification capability of Chlorella is due to its incredibly high content of chlorophyll and its ‘cracked’ cell walls. They have the uncanny ability to ‘grab onto’ unwanted materials, pollutants and some heavy metal residues and help support the body in the detoxification process. Chlorella contains enzymes such as chlorophyllase and pepsin, which are two digestive enzymes. Enzymes perform a number of important functions in the body. Take up to four tablets per day with meals, or as your health professional advises. 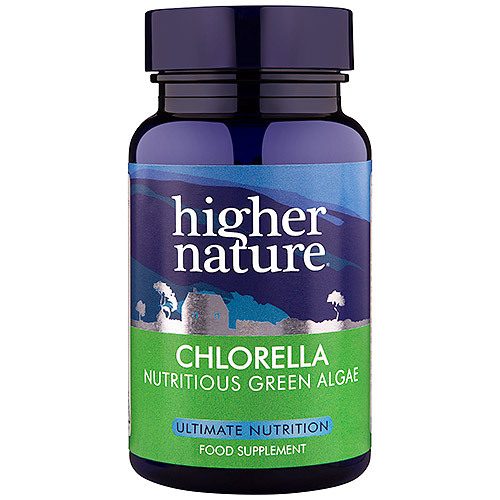 Below are reviews of Higher Nature Chlorella - 180 x 250mg Tablets by bodykind customers. If you have tried this product we'd love to hear what you think so please leave a review. 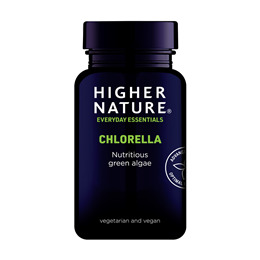 Question about Higher Nature Chlorella - 180 x 250mg Tablets Could you please tell me if the chlorella you stock is organic? Organic standards in the production of Chlorella are almost impossible to ascertain, however, our chlorella is grown in the US under the strictest procedures. You should note that organic standards vary considerably throughout the world and some countries apply standards which would not be deemed organic in others.